I posted about this in my recent purchases from Asos.com on Tuesday and have had it on for a couple of days so thought I’d do a review for it. I love the speckle egg effects that are around at the moment and I have a few from other companies but I saw this when I was looking on the website and it stood out because of the colour, I think most of the others are in pale shades, or at least the ones I have. 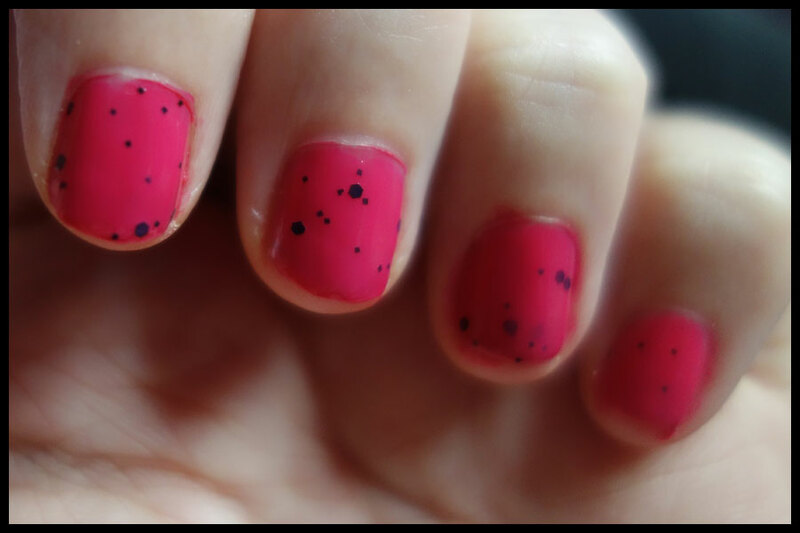 This is an Anna Sui nail varnish from the chocolate chip collection, I chose the Cassis Pink version as it was such a pretty colour and so bright compared to most of the others. It is available in both of the bottle versions but this was the version that was in stock and I haven’t got any in this bird design so I probably would have gone for this one anyway. It’s £11 on Asos.com, though it keeps going between in and out of stock so I’m not sure whether it’ll still be there. I haven’t seen them anywhere else but they’re probably available in other stores especially if you live in another country. The first thing that I love about this nail varnish is the cardboard box it came in, I really liked the other dress design boxes too with the colourful flowers but this pattern in black and white makes them stand out. I think that all of the bird versions come in this, though I may be wrong. I did end up keeping the boxes from my other bottles for a while but ended up throwing them out as they weren’t really used for anything and I like the look of the bottles anyway so this one will probably go in the recycling too. 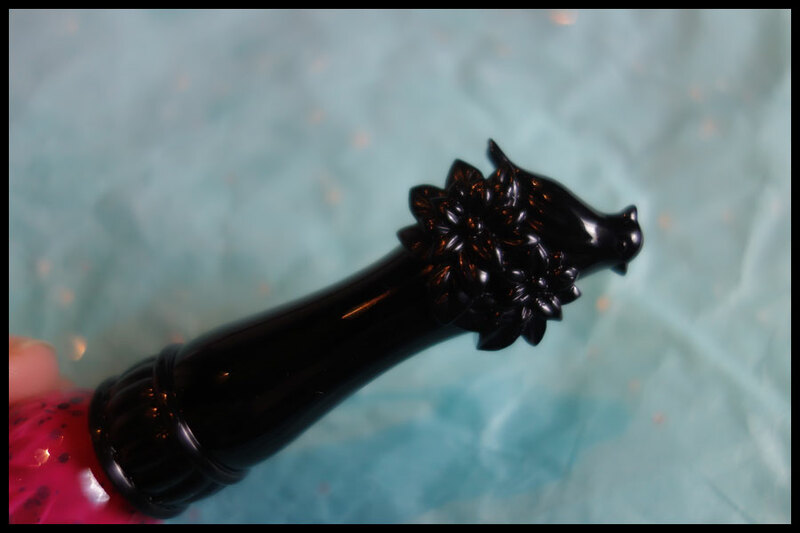 The bottles themselves of the nail varnish in the Anna Sui collection are gorgeous, I love them and if I had a dressing table I’d probably have them sat out on the top of it. I have some of the dress bottles which are nice and both versions seem to hold the same amount of nail varnish, this photo shows the two different versions available though it’s the wrong colour in the dress. This bottle has such a long handle it’s easy to hold and control even when my hands are shaky, which happened when I was doing this. I find the brush itself easy to use even though it just looks like a fairly thin standard brush, maybe the handle makes it more manoeuvrable, but I’ve found it so much less messy using both versions than I do with others with a similar brush. 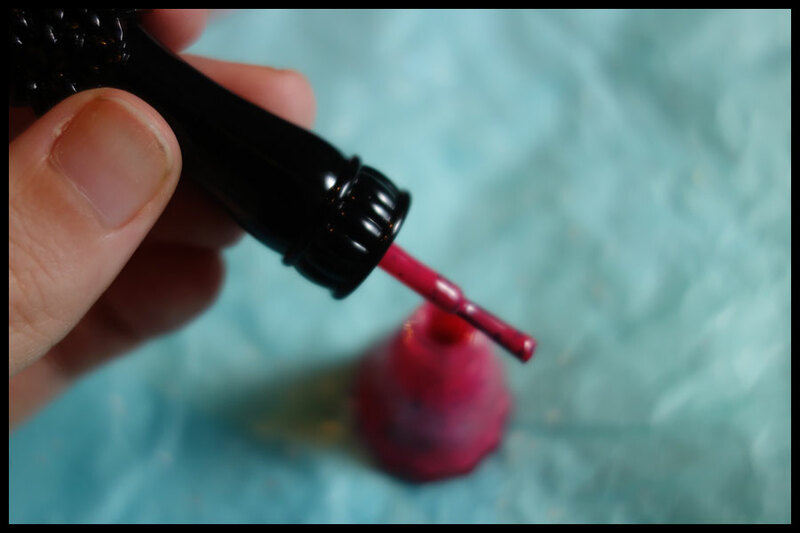 The brush does hold the nail varnish well and, if it wasn’t for the speckle particles, it would cover one hand in one dip in the varnish, I just went back in the bottle to pick up more of the particles to spread around. One thing about the nail varnish that isn’t advertised but I love is the smell of it, which sounds like a weird thing to say about a nail varnish. When it’s dry it smells of roses, it’s subtle enough to not be obvious if you’re typing or something but when I go to push my glasses up or apply lip balm I can smell it and it lasts for days. Without a top coat I’ve had it last for over a week before which impressed me as a lot of those sold as scented don’t last as well. It’s like a proper rose as well, as if you go up to a scented rose in the garden and smell it rather than the fake or overly sweet rose you often get in rose scented products. 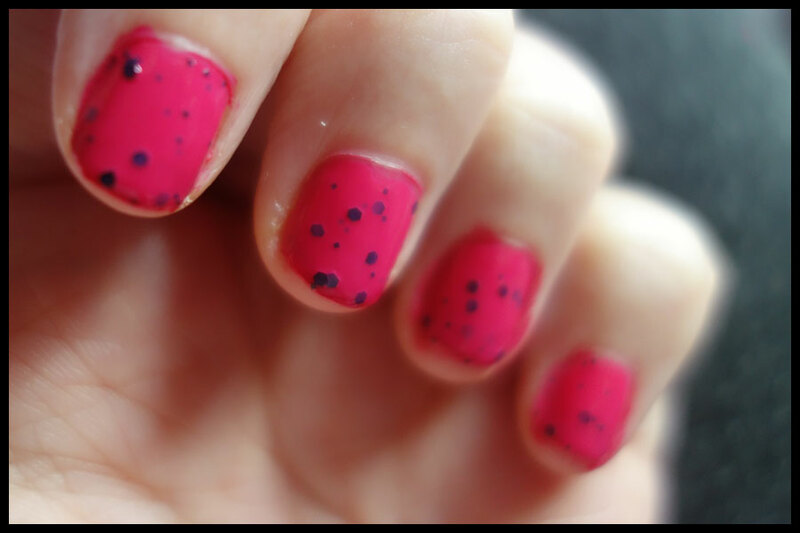 The nail varnish itself is a pretty pink, it’s a very bright pink that’s almost a red. It looks more of a bluey pink in the bottle but when it’s on my nails it’s definitely closer to a red colour which surprised me. As it’s a nail varnish designed to be done in layers with the colour only partly covering the particles to give it depth it is a very thin nail varnish and the first coat isn’t opaque at all. The second coat would actually be enough if you want the pink part to be opaque but at that point in application I didn’t have many of the particles in so I went for a third coat. Even with three layers the particle coverage isn’t great, on my right hand my middle finger has five larger particles and six small ones which isn’t much on a finger and some of them are a bit clumped together on others. The brush is easy to use but the formula does not lend itself to being able to place the particles easily. I found that when I tried, as it was so thin, it would start to take up the previous layer and I was worried about trying too much and making it too thick. I think maybe if I tried to place it more on the second layer and then did a top layer to smooth it over would be how I’d try it next time. The main reason I love these nail varnishes is how well they last on my nails, it’s been over two days since I applied it and there’s no chipping even without a top coat. I think it’s the fact it’s so thin and layers so easily that it just seems to melt together and last. I’ve had other makes that cost more, a lot of Nails Inc for example, that don’t last as well so even though it’s £11 which is more than I normally pay for a nail varnish if it works really well for me and is something that stands out it’s worth it for me. I don’t see all that many posts in blogs about the Anna Sui nail varnishes and I’m surprised that I haven’t if they work this well for everyone else considering how many Nails Inc reviews there are. I know there isn’t the same range as the others and maybe a lot of people see the bottle as a bit of a gimmick and are worried about the quality of the nail varnish inside which is fair enough, I was at first but bought my first one in a sale so it wasn’t so bad if it had failed. I suppose maybe the nail varnish, and makeup line, isn’t well known (at least in the UK) so they don’t have as much exposure. It probably doesn’t help that when I saw videos on youtube from America they had numbers rather than names and it took a bit of looking to work out which were which in the UK naming system. I would say that some of the colours available are very common and there are plenty of dupes out there but some of the more recent collections are more unique. Since bringing out the bird design bottles there are more collections and some of the individual polishes in them really stand out, there’s a green in the glitters that I really wanted and some of the summer ones with glitter or shimmer in stood out to me too but they were all out of stock. Overall I do love this nail varnish, so far it’s impressed me as much as the previous ones I’ve bought from the company. It lasts well for me and doesn’t chip much even when I’m using my hands a lot. I’m not sure there’s much else I expect from nail varnishes if I like the colour so it ticks all the boxes along with great packaging and a nice smell, though that may put some people off as it does actually have a scent. They do separate a bit more than others I have when sat upright in the box I keep them in but a bit of a shake and they’re good to go, plus I haven’t had any dry out on me. Have any of you tried the Anna Sui nail varnishes? Did they work as well for you?